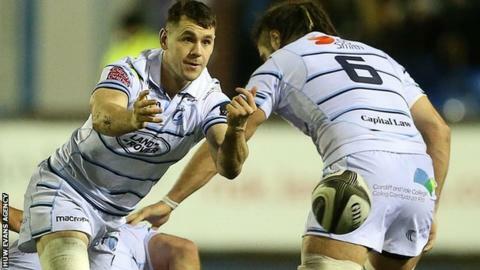 Wales international Tomos Williams has signed a new Cardiff Blues contract. The 24-year-old scrum-half follows Jarrod Evans, Josh Navidi, Kristian Dacey and Willis Halaholo in agreeing to stay at the Arms Park. The Blues have also signed Josh Adams from Worcester Warriors and Hallam Amos from Dragons. Williams started for Wales in their 23-19 win against France in February, but a calf injury kept him out of the remainder of the Grand Slam campaign. It was Williams' try - from a break by Adams - which started Wales' comeback after they trailed 16-0 at half-time, and was his third touchdown in seven appearances. "This is my home region and I am really happy here," Williams said. "We have a good squad, with a lot of young, exciting players that I have come through the ranks with and are now very good friends. "Now I am just looking forward to some massive games in the remainder of our season and hopefully helping the Blues reach the Pro14 play-offs." Head coach John Mulvihill welcomed the deal with Williams, who has made 81 appearances for the Blues since his debut in 2013. "Tomos is another local, exciting player to come through our pathway and is the best attacking scrum-half in Wales," he said. "He's an important attacking and defensive spark for us. He has produced big moments in big games. "He wants to be the number one scrum-half not just at Cardiff Blues but Wales, and that hunger and competitiveness is a great asset. "The competition between Tomos, Lloyd Williams and Lewis Jones is really positive and brings the best out of all three players."